Reports are gathering that Sharp is ready to produce a 5.5-inch IGZO touchscreen with a massive 3,840 x 2,160 pixel resolution next year, meaning the first devices with one fitted could be out before the end of 2016. This would mean the phone in your pocket could match the 4K television in your living room, pixel for pixel. There doesn’t seem to be an official announcement from Sharp on the subject at the moment, and reports initially started via Japan’s NHK broadcaster on April 10, but with minimal information. Since then, some images from a Sharp presentation on the panel were published by TechBlog.gr, providing more specs and details. The 3,840 x 2,160 (which is technically a UHD resolution, rather than a full 4,096 x 2,160, 4K pixel count) screen will apparently have a pixel density of 806ppi. To put that into perspective, the LG G3’s 5.5-inch, 2,160 x 1,440 pixel screen has a 538ppi pixel density, and the 5.1-inch Galaxy S6 has 577 pixels per inch. Sharp’s IGZO screens are known for low energy consumption, sharp images, and borderless designs. 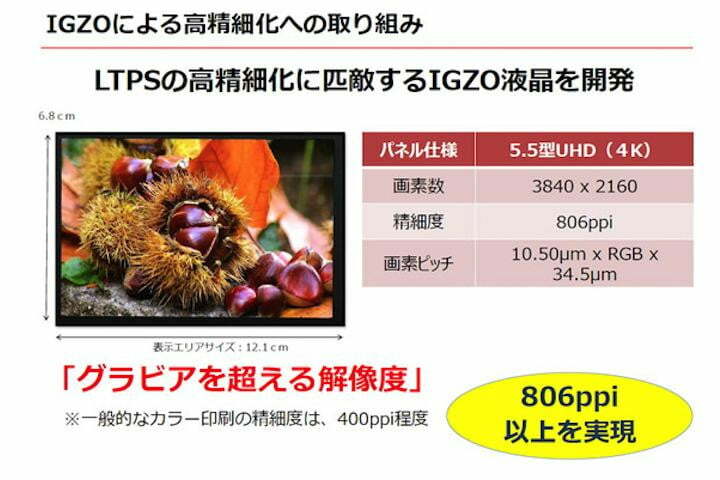 Where can we expect a 4K Sharp IGZO screen to show up? Chinese smartphone companies are apparently first on the list, and that could mean anyone from Huawei to Xiaomi, but we should also expect Sharp itself to use one of the panels on a future smartphone. Why will we want it? 4K resolution televisions will only become more common, and smartphones that can shoot 4K video will be one of the primary sources of content for these new screens. It makes sense for the display on the phone to be able to replicate those videos perfectly. This isn’t the first time Sharp has talked about small, very high pixel density screens. In November last year it revealed a 4.1-inch screen with a 2,560 x 1,600 pixel resolution, returning a massive 736ppi pixel density. Will Audi show us the future of the Allroad wagon in Shanghai?